Look around your workplace--how do you store your chemicals? During inspections, I notice that usually chemicals are stored (or not stored) randomly all over the workplace. They are left where they were last used or shoved back onto shelves with newer chemicals placed in front of them. Shelves are overcrowded and workers have to move stuff around to reach the required container. When it comes to hazardous materials, we know it's important to have a written policy, Material Safety Data Sheets (MSDS's) and train employees on how to work with chemicals safely, BUT it is also extremely important to store these substances safely. Chemicals must be stored in accordance with strict OSHA (Occupational Safety and Health Administration) regulations. Improper storing and handling can lead to serious consequences. Materials Handling and Storage Regulations are found in 29 CFR 1910 Subpart N. Store everything according to OSHA's general storage requirements. Storage of material must not create a hazard. Aisles and passageways must be kept clear. Material must be stored securely. Storage areas shall be kept free from accumulation of materials that constitute hazards from tripping, fire or explosion. In addition to the basics, OSHA has specific chemical storage requirements (see 29 CFR 1910 Subpart H). These requirements are based on the type of chemical, its container and even on how it's used. For example, in the Flammable and Combustible Liquids section, is information on how much of a chemical that can be on the premises, what kind of storage cabinet is needed and even where you can or cannot put that storage cabinet. 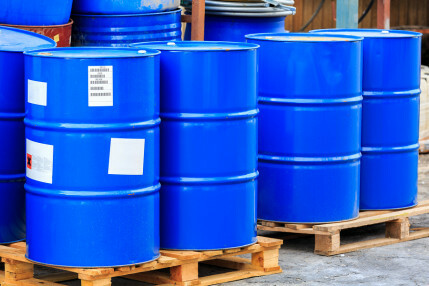 Before a chemical can be stored properly, we need to know its hazards. This is where the MSDS comes in. An MSDS provides us with all data known about a chemical including its hazards. Chemical hazards are: flammable/combustible, reactive, toxic, explosive, oxidizing, carcinogenic and corrosive. They can be health hazards. When trying to determine these hazards, review these sections. This gives information on the physical properties of a chemical, including its color and odor so it can be identified. Under what conditions is it a liquid, solid or vapor. What are the freezing or boiling points. Is it an acid or base. This section describes how to prevent a fire or explosion when storing and using the product. This section tells you under which conditions dangerous chemical reactions can occur. How to avoid dangerous mixtures and how to use appropriate storage methods. This section includes information on acute (short-term) and chronic (long-term) health effects, signs and symptoms. It gives first aid procedures to follow in an emergency. Store like chemicals together and away from chemicals that might cause a reaction if mixed. All chemicals should be labeled and dated. Flammable materials should be stored in approved, dedicated, flammable materials storage cabinet. Liquids should be stored in unbreakable or double-contained packaging or storage cabinet should have the capacity to hold the contents if the container breaks. No flames or hot work in flammable/combustible storage area. Remember, while it is important to work safely when using chemicals, it is just as important to store hazardous materials safely according to MSDS and OSHA requirements.